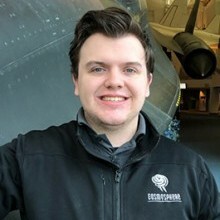 Steven Birdsall joined the Kansas Cosmosphere and Space Center as finance manager in August of 2005. 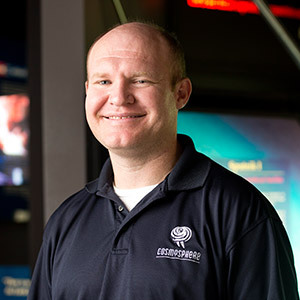 Steven manages the Cosmosphere’s accounting and human resource departments. 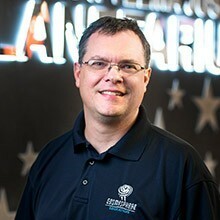 He also manages the accounting for the Cosmosphere Foundation. 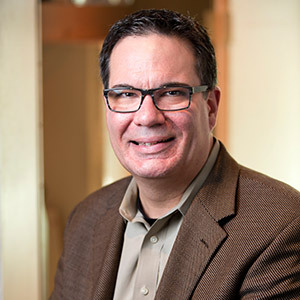 Steven began his career in public accounting as a staff accountant/auditor. He received his bachelor’s degree in accounting from Kansas State University in 2003. 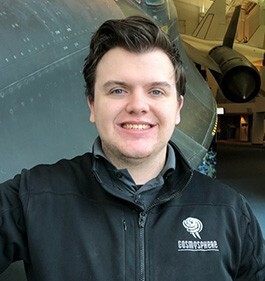 He enjoys the variety in his role at the Cosmosphere along with the inspiration that comes from being part of the organization. "The Cosmosphere brings variety to the work day that you won’t find anywhere else. If you ever get tired of what you are working on you can take a break and experience the exhibits. 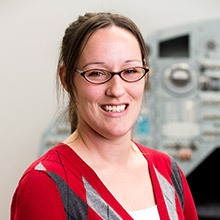 I find it inspiring thinking about all the hard work and dedication that went into the space program." 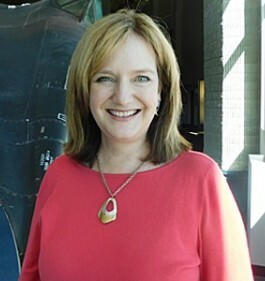 Mimi Meredith oversees the organization’s fundraising efforts. 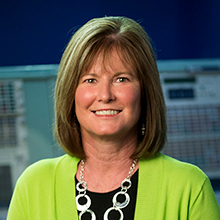 Over the past 25 years, she has held leadership roles in marketing, public relations and development for a variety of organizations in Kansas and Arizona. She is a seasoned communication strategist and has consulted with a variety of nonprofit boards regarding development and effective fund raising. 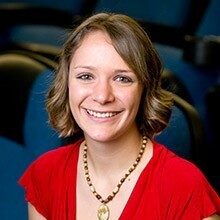 Meredith is a graduate of Cottey College and the University of Kansas School of Journalism. 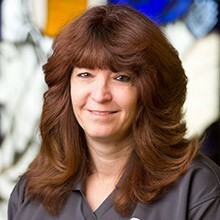 She is certified in fundraising programs through the Institute of Charitable Giving. "I feel like I’m a professional matchmaker. 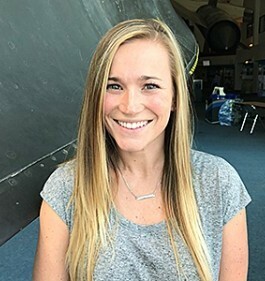 I get to know people who have a passion for space and delivering learning opportunities to today’s students, and then I show them how they can have a lasting impact in those areas through supporting the Cosmosphere. It’s a relationship that brings them satisfaction and joy, while their commitment and financial support means we have a broader base of advocacy and long term viability. It’s a truly mutually beneficial relationship! I am continually inspired by Patty Carey’s determined and passionate commitment to this place. She was a leader among leaders—a woman who shared her vision in a way that was irresistible and created a resource that will last for generations. I want to follow in those footsteps." 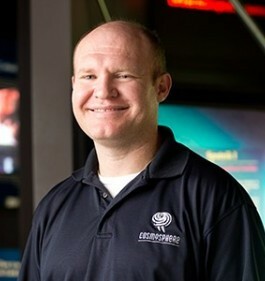 Jack Graber is the Vice President of Exhibits and Technology at the Cosmosphere. 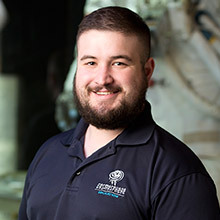 He oversees the museum’s collection and artifacts, the IT infrastructure, SpaceWorks—the Cosmosphere’s restoration and replication division and general building maintenance. 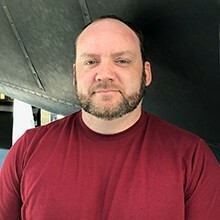 Jack began his career with the organization in 1998 as the Technology Director. During his time, Jack has participated in a number of large-scope projects in the museum and for SpaceWorks. 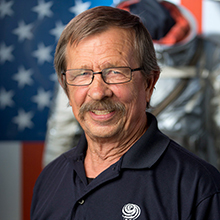 Some of the notable projects Jack has been a part of include: the restoration of Liberty Bell 7, Gemini 6, Gemini 10, Gemini 12, Apollo 13 and the V2 rockets. 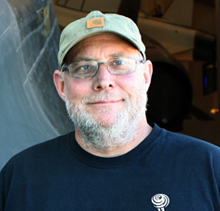 Additionally he has helped build display cases and museum exhibits for other institutions including the Smithsonian, the Evergreen Aviation & Space Museum, and two international traveling exhibits. 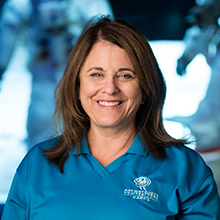 Michele McCartney is the Vice President of Marketing and Creative at the Cosmosphere. 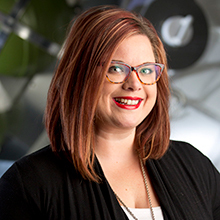 She oversees all of the organization’s marketing, creative and branding efforts. 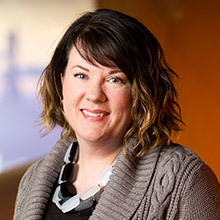 She has been instrumental in designing galleries and exhibits for the museum, as well as print and digital materials for operations and marketing. 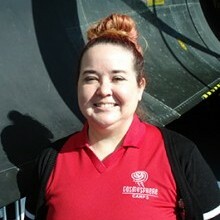 Michele began her career with the organization in 2008 as the Creative Design Manager. During this time, Michele has participated in a number of significant projects for the Cosmosphere. 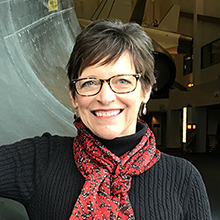 Some of the notable projects in which Michele has been involved include the design work for an exhibit, commissioned by Amazon.com CEO Jeff Bezos' company, Bezos Expeditions, showcasing the recovery and conservation of F-1 engines from the Apollo program. She designed the gallery and exhibit plan for the B-29 Doc Hanger and Education Center in Wichita, Kansas. In early 2019 she began work on a Team II grant funded by NASA. 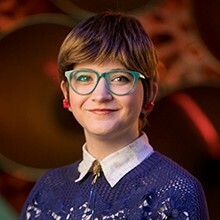 Michele holds a Bachelor of Fine Arts degree in Graphic Design and 3D Design from the Kansas City Art Institute, Kansas City, MO. 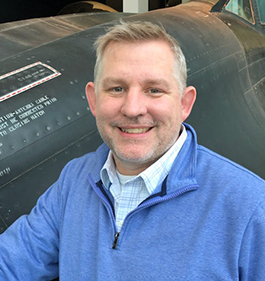 Favorite Artifact: Nathan Meyer, Vice President of Strategy + Product Innovation, stands in our Grand Lobby at the nose of a flown Lockheed SR-71A Blackbird, the world’s fastest spyplane. A recognized expert in the areas of museum administration, strategic planning and space artifact preservation and exhibition, Jim Remar began his career in 1997 as executive director of the Mifflinburg Buggy Museum in Mifflinburg, PA. 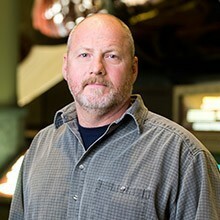 He joined the Cosmosphere as curator in 2000. 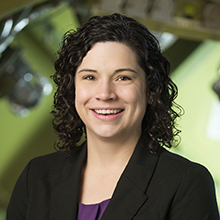 After eight years at the Cosmosphere, Remar joined the team at Gregory, Inc as Vice President of Operations. 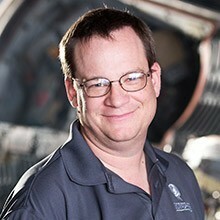 In 2012, Remar returned to the Cosmosphere as President/COO where he was responsible for all operations of the organization, including SpaceWorks, the department of the Cosmosphere responsible for the restoration of artifacts as well as the fabrication of exhibitry and high fidelity replicas. 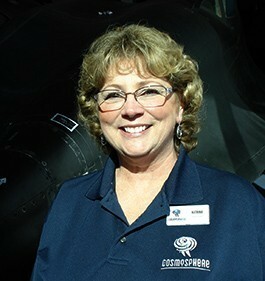 The Cosmosphere’s governing board named Remar CEO of the organization January 2018. 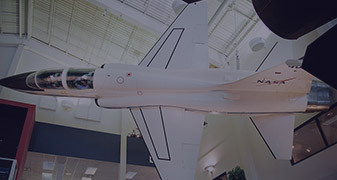 A variety of organizations have benefitted from Remar’s consulting expertise including the White Sands Missile Range Museum, National Air and Space Museum, Fort Bliss Museum, National Aeronautics and Space Administration, Oklahoma State Museum of History, the Adler Planetarium and the Evergreen Aviation and Space Museum. He has also served as an editor and consultant for several print publications. 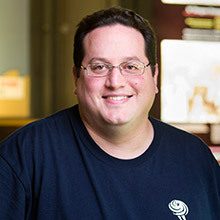 Remar received his bachelor’s degree in History and Political Science from Washburn University; his master’s degree in museum studies with a minor in history from the University of Nebraska and his mini-MBA from Wichita State University. "I love the fact that right here, in Hutchinson, Kansas, we have an attraction the likes of which you wouldn’t find in most big cities. I love our world class collection of artifacts related to the exploration of space, including my personal favorite, the White Room. 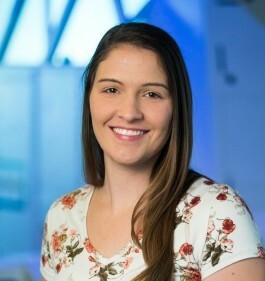 I could go on about why I love working here, but at the end of the day our ability to impact and inspire young minds is why I walk through the front doors every day." Don Aich, SpaceWorks Technician, is pictured with astronaut Gus Grissom’s Mercury spacecraft, Liberty Bell 7 that sunk off the coast of Florida in 1961. It was recovered from the ocean floor in 1999 and completely restored by the Cosmosphere’s SpaceWorks Restoration Team. steveb@cosmo.org Steve Barnum, Retail Operations Manager, stands in front of the actual Gemini X. Gemini X was designed to achieve the objectives for the last two missions –rendezvous, docking and extravehicular activity (EVA). jordonb@cosmo.org Jordon Appel-Benton, space science educator, stands in our Grand Lobby at the nose of a flown Lockheed SR-71A Blackbird, the world’s fastest spyplane. Dante Brown, Maintenance Crew, stands with the V-1, or “Buzz Bomb” in our German Gallery. The V-1 was the first jet-powered missile used in war and the forerunner of today’s cruise missile. dalec@cosmo.org Dale Capps, SpaceWorks Restoration Manager, stands in our Grand Lobby at the nose of a flown Lockheed SR-71A Blackbird, the world’s fastest spyplane. katrinad@cosmo.org Katrina Drummond, Finance Assistant, stands in our Grand Lobby at the nose of a flown Lockheed SR-71A Blackbird, the world’s fastest spyplane. 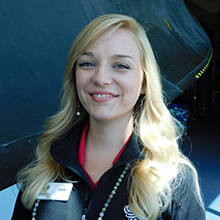 marlae@cosmo.org Marla Eriksen, Membership + Cause Marketing Coordinator, stands in our Grand Lobby at the nose of a flown Lockheed SR-71A Blackbird, the world’s fastest spyplane. kelseyg@cosmo.org Kelsey Genschorck, Marketing + Development Assistant, stands in front of the RD-107 rocket engine in the Cold War Gallery. sheilah@cosmo.org Sheila Harmony, Executive Assistant, sits at the console of an actual Mission Control panel removed from a mission control room in Houston. jeramyj@cosmo.org Jeramy Janzen, SpaceWorks Technician, stands in our Grand Lobby at the nose of a flown Lockheed SR-71A Blackbird, the world’s fastest spyplane. helenek@cosmo.org Helene Kain, school programs manager, stands with two lunar space suit models that were used for training during the Apollo missions. laurap@cosmo.org Laura Page, International Space Science Educator, stands in front of Sonic Wind II, a rocket-propelled sled. 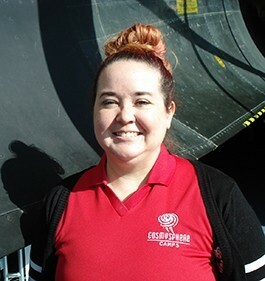 elicial@cosmo.org Elicia Lance, Finance Assistant + Human Resources Coordinator, stands in front of a replica Soviet Voskhod spacecraft with flight-ready Volga airlock. melissal@cosmo.org Melissa Leikam, Food Services Manager, stands in front of an 8’x 11’ stained glass window that was designed to pay tribute to the 17 American astronauts whose lives were lost in the Apollo 1, space shuttle Challenger and Columbia missions. robertl@cosmo.org Robert Lounsbury, space science educator, stands in our Grand Lobby at the nose of a flown Lockheed SR-71A Blackbird, the world’s fastest spyplane. chuckm@cosmo.org Chuck McClary, Space Science Educator, stands with two lunar space suit models that were used for training during the Apollo missions. bradn@cosmo.org Brad Nuest, Space Science Educator + Scout Programs Manager, stands in front of the Justice Planetarium which houses the Spitz Sci-Dome XD digital projection system providing full-dome immersion for all shows and provides fully customizable presentations that will bring the galaxy to you. jessicap@cosmo.org Jessica Pfeifer, Assistant Box Office Manager, stands in our Grand Lobby at the nose of a flown Lockheed SR-71A Blackbird, the world’s fastest spyplane. samanthas@cosmo.org Samantha Schneider, Box Office Operations Manager, sits in the Carey Digital Dome Theater, which features the most cutting edge technology in digital projection in the nation, featuring a custom-designed lens that allows us to project on the full dome with the highest resolution and clarity available. 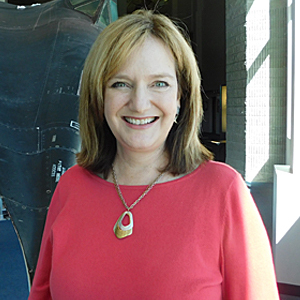 michelles@cosmo.org Michelle Snyder, Space Science Educator, stands in our Grand Lobby at the nose of a flown Lockheed SR-71A Blackbird, the world’s fastest spyplane. kristens@cosmo.org Kristen Spurlin, Education Coordinator, stands in our Grand Lobby at the nose of a flown Lockheed SR-71A Blackbird, the world’s fastest spyplane. carlas@cosmo.org Carla Stanfield, Public Relations Coordinator, stands in front of a Redstone rocket in the Cold War Gallery. Mike Stewart, Maintenance Crew, stands in front of a Mercury space suit worn by Wally Schirra on MA-8/Sigma 7.
joannas@cosmo.org JoAnna Strecker, Space Science Eduator, stands in our Grand Lobby at the nose of a flown Lockheed SR-71A Blackbird, the world’s fastest spyplane. billt@cosmo.org Bill Tucker, Plant Services Operations Manager, stands in front of an actual V-2 rocket that resides in our German Gallery. The V-2 rocket was the first long-range guided ballistic missile and was created as a weapon of mass destruction. shannonw@cosmo.org Shannon Whetzel, Curator, sits in front of a mock-up of an Apollo Command Module control panel, currently in storage in our Collections Department. The Cosmosphere displays only 7% of approximately 15,000 space artifacts. The other 93% of the collection, the part you don’t see, is housed in the Cosmosphere’s vaults and warehouses. Credentials & Length of time at Cosmosphere: B.S. Biochemistry, M.A.T. 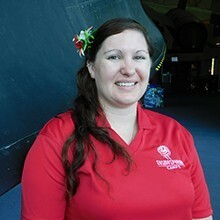 Teaching, six years teaching high school science, one month at the Cosmosphere. What drew you to becoming involved in Cosmosphere camp? A love for science and trying to help others see how awesome it is. What do you most look forward to this camp season? Meeting kids who love science (and space) as much as I do. 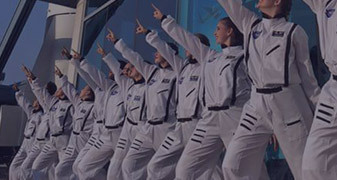 What do you hope to accomplish this year being involved with Cosmosphere camp? 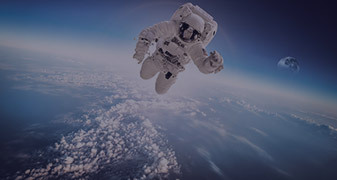 Help kids grow in their knowledge and passion for space science. 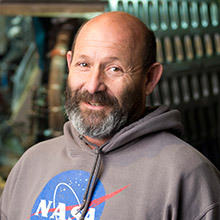 Brad Nuest is a long-time amateur astronomer, space enthusiast, and fan of the Cosmosphere. 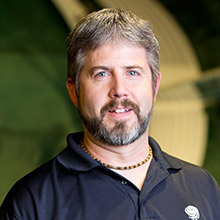 In 2007, Brad was hired to lead the Boy Scout Astronomy Merit Badge program. He was soon performing at Cosmosphere shows and taking on other duties, which lead to full-time employment. Brad holds a B.A. 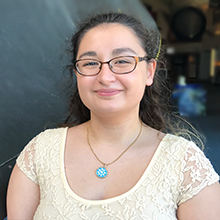 in Communications from Sterling College, writes a monthly astrology column for the Hutchinson News and is our expert on many things related to space and the sky.